In an effort to fill the country’s recent revenue collection gaps, the Bank of Tanzania (BoT) has given the government nearly Tzs 600 billion from the stimulus package that was announced last year by President Jakaya Kikwete. According to Prof. Benno Ndulu, the governor of the BoT, this funding is part of the total Tzs 1.7 trillion stimulus package that was reserved in order to shield the country’s economy from the effects of the global financial and economic crises. Money from the stimulus package that has been allocated to the government has reportedly been used to support the education, health and agriculture sectors. In addition, the stimulus plan is intended to be used as a means to directly compensate exporters for losses, to guarantee debt rescheduling, and to increase the loans that are provided to farmers in order for them to obtain seeds, fertilizer and tractors. Apart from the agriculture sector, other sectors that are critical to the country’s economic stability are also scheduled to receive funds from the stimulus package; these sectors include investment, infrastructure and food security. 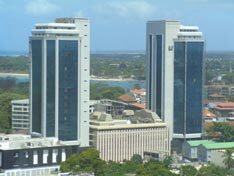 Additionally, the government has also reportedly planned to grant guarantees to financial institutions in order to deal with various loans, amounting to Tzs 270 billion, that had been given to companies which they later failed to repay due to the economic crisis. The terms of the guarantee have been set to extend for 2 years, during which time, based on arrangements that have been made between the government and the financial institutions that have extended these unpaid loans, the firms will not be charged interest on their repayment for the duration of the guarantee. In a recent interview with The Citizen, Prof. Ndulu indicated that the shortfall in revenue collections has been caused, in part, by the recent global financial crisis, saying that the government had already borrowed Tzs 473 billion from the stimulus package and had also floated bonds that were worth Tzs 120 billion in an effort to further bridge the gap in the country’s revenue collection. According to Prof. Ndulu, recent reports, which indicated that approximately Tzs 400 billion of the money that was loaned to the government by the International Monetary Fund (IMF) had been given to local banks, were unfounded. Prof. Ndulu went on to explain that these funds were not meant to be distributed to local banks, but rather were to be used in order to stabilize the foreign exchange reserve. In addition, the BoT governor said that no entity, other than the government, had received money from the stimulus fund, but that arrangements had been made in order to guarantee that those who were promised assistance through the fund were given assistance through selected banks, which are scheduled to begin receiving money from the package within a few days.